The use of ECOFILTER® in thickening on filter presses and belt filter presses optimizes the capacities of your installation and eliminates clogging of the supporting cloths. ECOFILTER® improves the preparation of the sludge and increases their dewatering capability by acting as a structuring agent. Ecofilter® as a filter aid, is mixed directly with the sludge to be dewatered, preferably before or during the flocculation or coagulation stage. The mixing is performed at a rate of 5 to 15 % in weight according to the concentration of products to be treated. 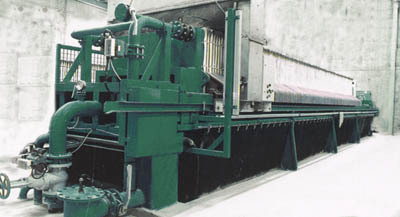 – Improvement in the behaviour of the sludge on the filter cloth. – Reduction in sludge creep and less cleaning needed. – Improvement in dryness and in the action of the flocculant and/or coagulant. – Increase in the agronomic and energy content of the sludge. – Overall reduction in the costs of filtration.